Dr. David Sanni-Thomas is an experienced Family Practice Physician with extensive training in adult, pediatric, and gynecological medicine. He earned his medical degree at New York College of Osteopathic Medicine and completed his residency in Primary Care at St. Barnabas Hospital in Bronx, New York. 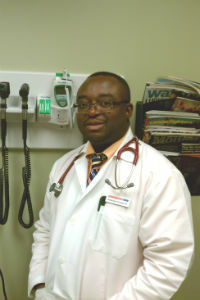 Dr. Sanni-Thomas specializes in Emergency Medicine, Primary Care, Ambulatory Medicine, and Workers Compensation. In addition to practicing medicine, Dr. Sanni-Thomas has previous instructing experience having taught Anatomy at the Drake School of the Bronx and as an Adjunct Professor at Monroe College in the Bronx. Dr. Sanni-Thomas is also a member of the American Osteopathic Association and the New York State Osteopathic Medical Society.